Mercedes-Benz has given the CLA and CLA Shooting Brake the mildest of facelifts, possibly to prevent distracting from a new engine that puffs out just 89g/km CO2. That’s down from 110g/km in the GLA 200d Sport manual, which is today's base version. 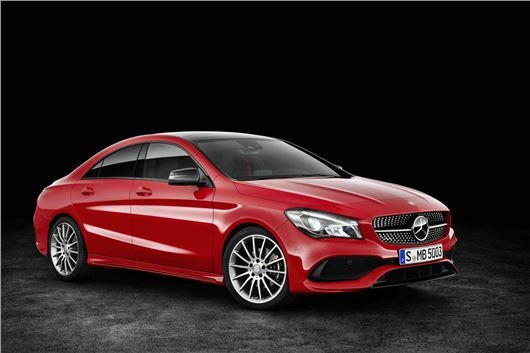 The new super-efficient model is called the CLA 180d BlueEffciency and goes on sale in April with the rest of the updated range. No prices yet, but expect the announcement to coincide with the official launch at the New York Motor Show, March 25, and start at around £26,000 – a reduction from today’s £27,385 take-up point. The CLA 180d uses a four-cylinder 109PS 1.5-litre diesel engine for its 78.5mpg combined consumption figure and 11.6-second 0-62mph time. There’s also a non-BlueEfficiency version that uses the same engine but not the aerodynamic stuff, meaning CO2 rises to 98g/km. No doubt that version will cost slightly less, despite being also VED-free under current tax law. The rest of the range remains largely as is, with 200d and 220d models making up the rest of the diesel range, and 180, 200 and 250 models the petrol choice. Most versions are available with a 7G-DCT automatic, which equipped to the 250 petrol engine makes for a 6.5-second 0-62mph time and 42.2mpg. On the styling, this really is the mildest of facelifts, including new bumpers, a slightly reshaped grille and some new wheels designs. There’s a new shade of blue and the option of full-LED headlamps now. In the cabin there’s the usual smattering of new trim, redesigned instrument dials and a thinner display screen. The infotainment gets a little more modern too, with the addition of Apple CarPlay. The Mercedes-AMG CLA 45 model has ben updated along similar lines, though specifically improved aerodynamically to reduce its drag coefficient – benefitting stability and handling, says Mercedes-Benz. Performance remains as it always was – mental. It has 381PS from a four-cylinder turbo engine, taking just 4.2 seconds to race to 62mph.